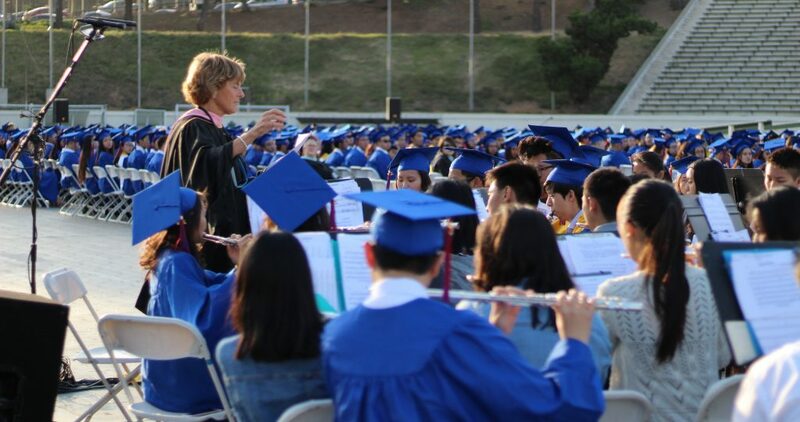 After teaching for 31 years at San Gabriel High School (SGHS), Tammy Cognetta ended her career, leading the band’s performance for the last time at the graduation ceremony on May 31. She decided to retire, or as she prefers to say, “graduate,” from her position as band teacher and swim team coach. After careful consideration, Cognetta decided that this year would be the right time to culminate her career. She wants to give the band enough time to get accustomed to a new teacher in time for their upcoming projects. Cognetta has a number of activities planned for her time off. Visiting Maine, Machu Picchu, and the Panama Canal are all places she has in mind; but aside from travelling, she also wants to continue music through the community orchestra and even go back to attending school. Though it feels like she has a lot planned, it still feels surreal to her. When she started college, Cognetta had her mind set on playing for a symphony orchestra. Due to unforeseen circumstances, she had to change her focus. She began pursuing a career in music education and after graduating, she began teaching at a number of different elementary and intermediate schools for different districts. Soon thereafter, an opportunity arose to go to Switzerland. After her return a year later, Cognetta decided that she wanted to begin teaching music to high school students. She found a job at SGHS and never left. This past year’s band president, senior Jenny Luu, is one of many students who have become very fond of Cognetta over their years spent with her. Senior drum major Christian Le said he was thankful for Cognetta’s time at SGHS, but also noted how he found himself “torn” over her retirement. 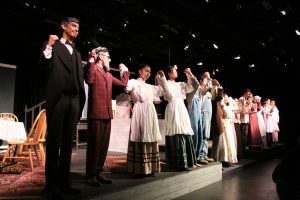 In addition to the students, choir teacher Cecilia Revilla-Heglund said she would deeply miss Cognetta and her enthusiastic presence. Though she leaves with a heavy heart, Cognetta is confident of the good state she has left the program in. Filled with wonderful memories, her heart remains with the students. And although she may be leaving, she plans to return to support the band and swim team in whatever way she can. Morality and Corruption of Lawyers: Criminal Defense Lawyers in America: Ethical, Moral, or Neither? I was a band member from 1996-2000 and the drum major in my senior year with Ms. Cognetta. My sisters and I truly appreciate her guidance while we were in the band. We all carried on our love for music in the UCLA marching band and in the Rose Parade. We are happy that she is transitioning to do things for herself and taking the time to “smell the roses”. Congrats Ms. Cognetta to a beautiful career! Tammy, you are the best no doubt about it. Thank you for all you have done for so many of us!